Celebrated as an aquatic form of divinity for thousands of years, the Yamuna is one of India’s most sacred rivers. A prominent feature of north Indian culture, the Yamuna is conceptualized as a goddess flowing with liquid love—yet today it is severely polluted, the victim of fast-paced industrial development. This fascinating and beautifully written book investigates the stories, theology, and religious practices connected with this river goddess collected from texts written over several millennia, as well as from talks with pilgrims, priests, and worshippers who frequent the pilgrimage sites and temples located on her banks. 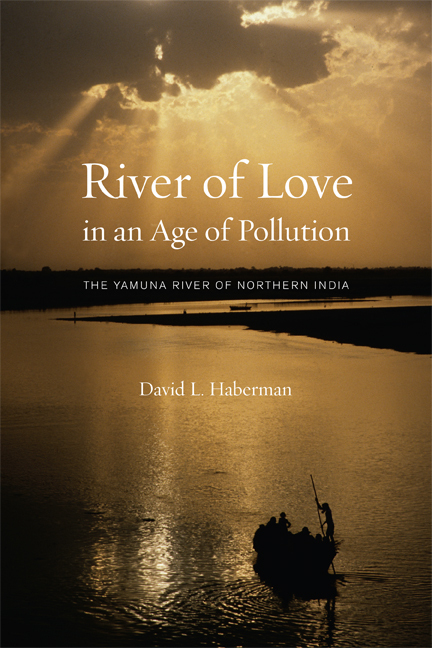 David L. Haberman offers a detailed analysis of the environmental condition of the river and examines how religious practices are affected by its current pollution. He introduces Indian river environmentalism, a form of activism that is different in many ways from its western counterpart. River of Love in an Age of Pollution concludes with a consideration of the broader implications of the Yamuna’s plight and its effect on worldwide efforts to preserve our environment. David L. Haberman is Professor of Religious Studies at Indiana University, Bloomington. He is the author of Acting as a Way of Salvation: A Study of Raganuga Bhakti Sadhana, Journey through the Twelve Forests: An Encounter with Krishna, and The Bhaktirasamrtasindhu of Rupa Gosvamin.